Wani had joined the Army in 2004 and was awarded Sena Medal for gallantry twice. New Delhi: Lance Naik Nazir Wani, who was a terrorist once, will be awarded Ashok Chakra posthumously, news agency ANI reported on Thursday. He lost his life during operation in Shopian district of Jammu and Kashmir last year. 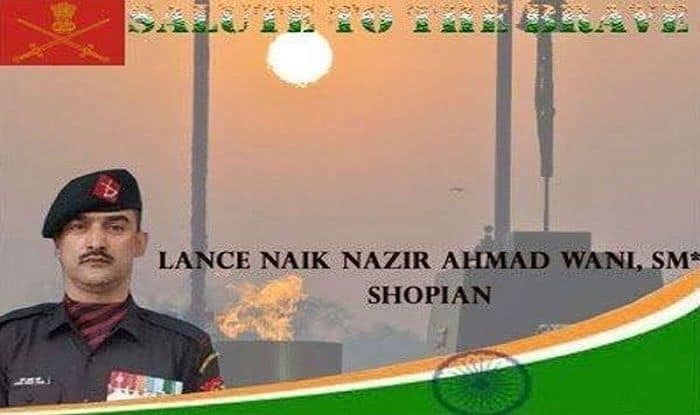 “Lance Naik Nazir Ahmad Wani exhibited the most conspicuous gallantry in personality eliminating two terrorists and assisting in the evacuation of his wounded colleagues and made supreme sacrifice in the highest traditions of the Indian Army,” a press release from the President’s Secretariat. Wani had joined 162 Territorial Army battalion in Kashmir. The 38-year-old resident of militancy-hit Kulgam district, who had joined the Army in 2004, had been awarded Sena Medal for gallantry twice. Wani’s battalion was attached with a unit of Rashtriya Rifles, a force carved out of the Army for fighting militancy in Jammu and Kashmir. He was martyred while battling terrorists at Shopian. Six terrorists were killed in the operation. In an anti-militancy operation in his native district in January 2007, he eliminated four militants and won Sena Medal. Wani is survived by a wife and two children aged 20 and 18 years.